When Bill Stumpf and Don Chadwick designed the Herman Miller Aeron Chair, they combined a deep knowledge of human-centered design with never-before-seen technology to create a task chair unlike any other. Now Aeron has been remastered in practically every way to create an ergonomic office chair that better supports people and the types of work we do today. The Aeron chair in graphite is currently available in the UK in limited finishes and will be delivered within 10 to 45 working days. Estimated delivery within 45 working days. Estimated delivery from 15 working days. Estimated delivery within 10 working days. While its iconic form has remained largely unchanged, the Aeron Chair has been remastered from the casters up. With the help of Don Chadwick, the chair’s original co-designer, we updated Aeron to incorporate more than 20 years of research on the science of sitting, as well as advancements in materials, manufacturing, and technology. Aeron is available in three tightly curated, holistic material expressions. 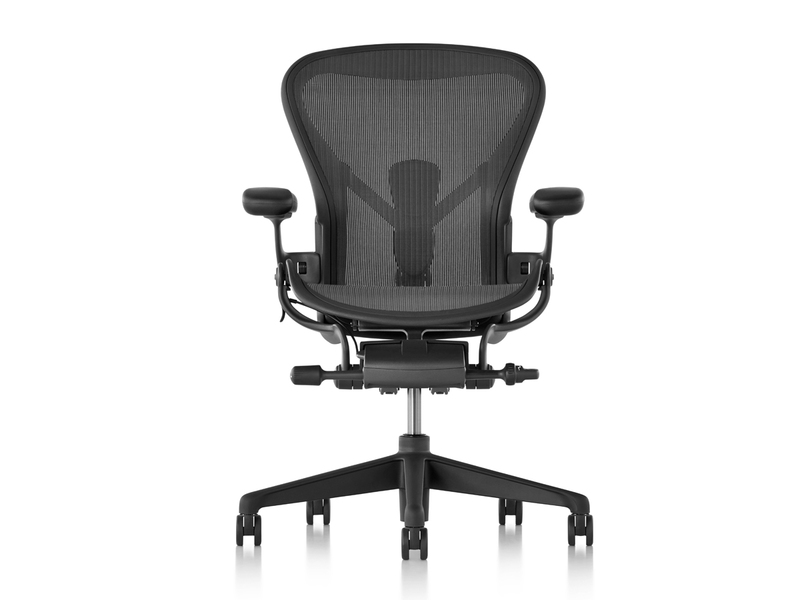 Graphite is the darkest, a modern rendition of the classic Aeron look. Carbon offers a balanced neutral for a modern chair that works equally well in both warm and cool environments. Mineral is the lightest, with a fresh, ethereal quality that borders on translucence. When designers Bill Stumpf and Don Chadwick set out to create a task chair that was health-positive, cross-performing, inclusively-sized, and environmentally sensitive, they arrived at a design unlike any the world had ever seen. And the world responded by making Aeron the best-selling and most recognizable office chair of all time. Aeron demonstrated a pioneering step in ergonomics and material innovation by providing comfort without the use of foam, fabric, or leather. It changed people’s perception of what a modern office chair could be, and in doing so, it soon found a place in popular culture. Fast forward to the present, and the same criteria serve as the foundation for a whole new Aeron. Just as iconic films and albums are updated for new mediums, standards, and audiences, Aeron has been remastered based on Herman Miller’s latest research around the science of sitting, advancements in materials, manufacturing, and technology, and today’s world of work. The office of 1994 would be largely unrecognizable today. With all the changes that have occurred, it only made sense that Aeron should also change to better meet the needs of people today. Do not rub too vigorously or you may damage the nap of the fabric or break fibers. Several light applications are better than one heavy application.